Drench – Instant hydration for skin. Marvellously refreshing, alcohol-free tonic that boosts collagen and elastin for radiant, healthy, “plumped-up” skin. Protects facial skin from cold winds, drying central heating, and scorching summer heat. Easy to use: Close your eyes and spray Drench directly onto face and neck before or after moisturizing to lock in hydration; pre-meditation or -yoga for a calming effect; or post-exercise for a revitalizing lift. But don’t stop there! Spritz on Drench at any time to uplift your skin and your spirit. Drench’s nutrient-dense formula delicately floods your skin with elite, organically-sourced nourishment: moisture-retaining hyaluronic acid, anti-inflammatory MSM, time-tested hydrosols to lift and refine skin texture, purest healing Aloe, Paracress – the “botox” plant, and over 200 vitamins, minerals, amino acids, polysaccharides, enzymes and glycoproteins for skin enhancement. Light floral notes with a hint of exotic wood. The dark violet Miron glass bottle protects Drench’s precious extracts. Each 50 ml bottle provides a 1-2 month supply, depending on use. Lovingly hand-crafted by Wendy in her Devon studio. Drench: the evolution of elegant hydration for your face. Click to order yours today! Easy to use: Close your eyes and spray Drench directly onto face and neck before or after moisturizing to lock in hydration; pre-meditation or -yoga for a calming effect; or post-exercise for a revitalizing lift. But don't stop there! Spritz on Drench at any time to uplift your skin and your spirit. Drench's nutrient-dense formula delicately floods your skin with elite, organically-sourced nourishment: moisture-retaining hyaluronic acid, anti-inflammatory MSM, time-tested hydrosols to lift and refine skin texture, purest healing Aloe, Paracress – the “botox” plant, and over 200 vitamins, minerals, amino acids, polysaccharides, enzymes and glycoproteins for skin enhancement. Light floral notes with a hint of exotic wood. The dark violet Miron glass bottle protects Drench's precious extracts. Each 50 ml bottle provides a 1-2 month supply, depending on use. DRENCH works beautifully! I apply it inbetween Jardin and Heart of Eternity. It gives a lovely “drenched” feel. Skin is intensely moisturized and LOCKED in! It is so easy to use in an attractive bottle with a gentle spray/spritz … our central heat is on and our cold winter is settling in so this extra treatment for my skin is bliss! I have had SO many compliments on my skin after being a SOLE USER of ONLY GLOW products for over 1 year … I am so very grateful to Wendy for providing a pure, organic, palm free, platinum skincare line! My skin looks, feels and IS the healthiest it has EVER been – THANK YOU WENDY and GLOW SKINCARE! I am a loyal and trusted customer! I am always excited and delighted to receive my products – it feels like Christmas! Even better, I love using the artisan creations. Wendy puts her knowledge, training, experience, heart and soul into the development of her formulations, always conscious of the environmental footprint, providing access of glorious products with the finest ingredients to everyday women. I am really enjoying using the Drench. So gorgeous just to spritz on first thing after Cleansing … very refreshing. Absorbs really well and quickly and makes the skin feel fresh and glowy. 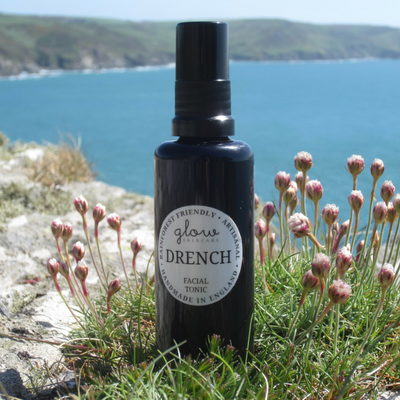 I love Drench – why is it so appealing to spray something delicious on your face? “I was always chasing whatever skincare issue would arise. A random pimple. Then dry patches. Irritation and redness. Wendy convinced me to try her holistic routine with the Glow Essential Collection, and I decided to keep a diary to track results. The first thing I noticed was the incredible scent when I received the package, my entire being took a deep breath and I instantly relaxed. From there it only got better. From the first use my skin felt stimulated, like it was coming to life. The deep moisturization was unlike anything I had experienced before. For two days I had a little bit of peeling as my skin renewed itself, revealing a youthful radiance that made me feel beautiful- without makeup! Now I feel like I have a skincare routine that supports my skin, as opposed to manipulating it. I have to say it is my all time favourite product – does everything when you don’t have time to do it all yourself!